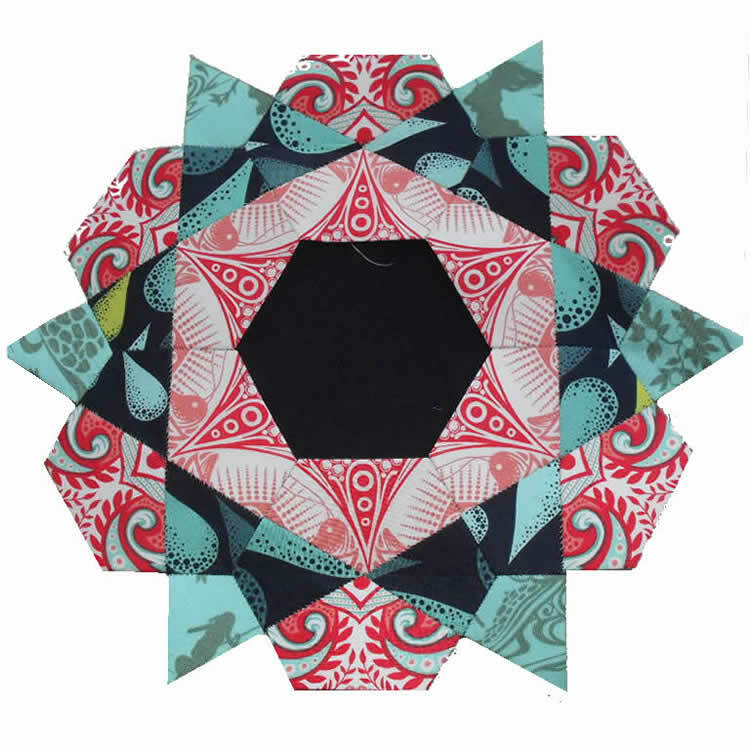 Each block looks great on it's own (perfect for cushions) but when you put them together there is just too much going on. Too much colour, too much pattern, and not enough space in between to give your eyes a rest. It's missing ... I don't know ... balance, cohesion, identity. What are the words I'm looking for ... it just doesn't make sense. 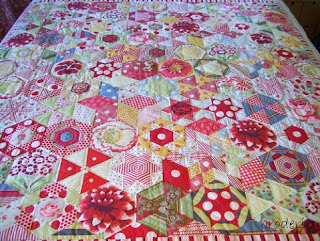 So it's back to square one with this quilt to find a way to bring it all together. I do have an idea about how I might make this happen, but I want to try it out before I tell you about it. It all comes down to how to use colour. I don't think I've found my feet with it yet. I look back at the quilts I've made over the years, and they've mostly ended up quite blahh because I've been unadventurous with colour. But last year, when I found Lily's Quilts blog and joined in her Hexalong doing the Candied Hexagons quilt, I went colour-mad and decided to go bright and bold with each block. It did not work. It definitely did not look like this GORGEOUS quilt by Lizzie Broderie. 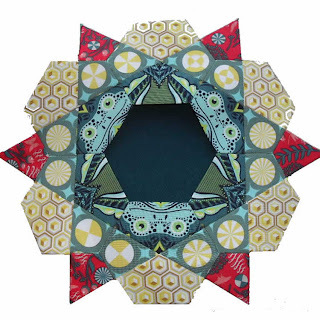 My Candied Hexagons are still in pieces. 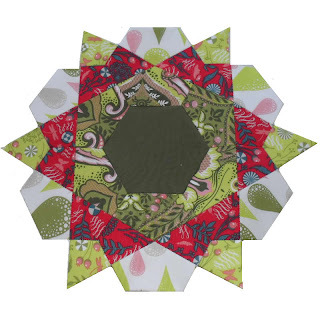 Same problem as with the Rose Star quilt, I jump into making the blocks without a clear idea of where I'm going and what the whole quilt will look like when completed. And if you can suggest any great tutorials for me to look at, I'd love to hear from you. Help me find my quilting style, my colour, my quilting mojo! Hello! Yes I'm still here. I'm sorry I haven't been blogging lately. Something's been on my mind and I've been tossing back and forth about what to do. I guess the best thing is just to tell you about it. 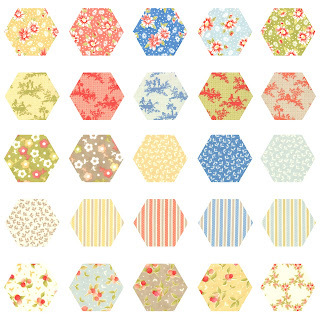 It's about my fabric hexagon packs, you know the packs containing the inchy-sized fabric hexagons. Surprisingly, when I started making them from Moda's ranges last year, it's turned out to be more economical to make them from Layer Cakes than from yardage. An added advantage is that my customers know exactly what they're getting in these packs, i.e. 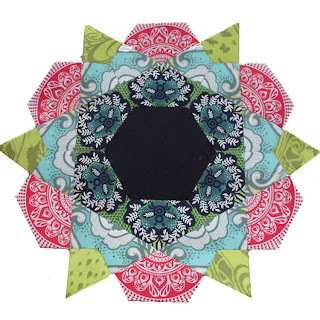 enough hexagons to make a standard inchy-sized flower out of each of layer of the Layer Cake. I've been putting 7 hexagons from each layer in each pack. That's enough for 6 petals for each flower (42 flowers per pack) plus a spare from each layer. However, I've found that if the Moda Layer Cake is even just a millimetre too small, there's not enough fabric to die-cut the spares. Even though the spare ones end up just a millimetre short on one side - which doesn't really matter if you're hand-stitching them - it really bothers me that they are not absolutely perfect! 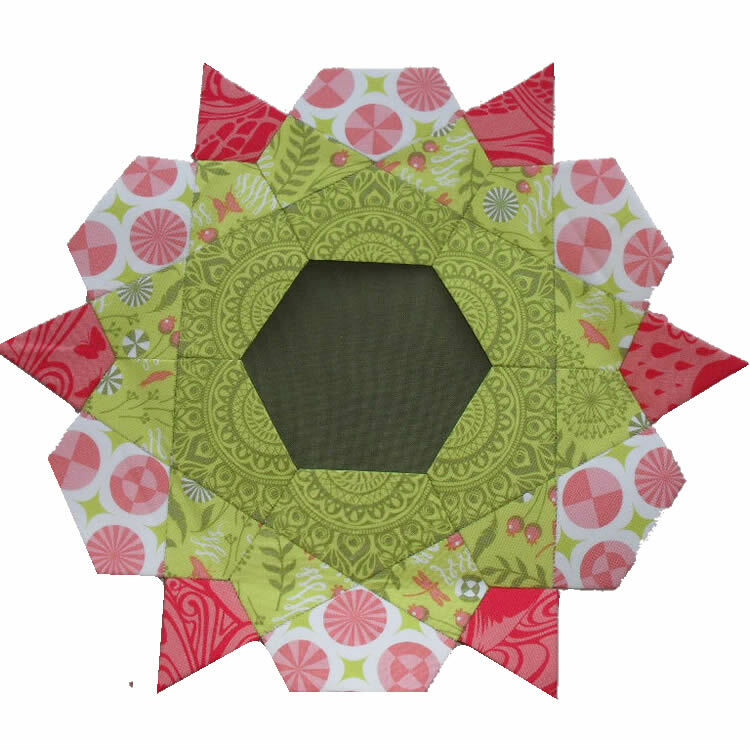 So from now on, each inchy-sized Hexagon Multi Pack will have 6 hexagons from each layer. That's 252 hexagons per pack and exactly enough petals for 42 flowers, but not the spares. 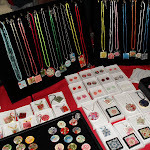 Circa 1934, Curio, Etchings, Giddy, Good Fortune, Hometown, Reunion, Rounneries Deux, Strawberry Fields and Terrain. You are welcome to pre-order them by emailing me. Just let me know which ones you want me to die-cut and I will put them to the top of my To Do list and make them within 24 hours. Oh, I almost forgot to tell you, the Free Offer is back on in my store until 6 March. 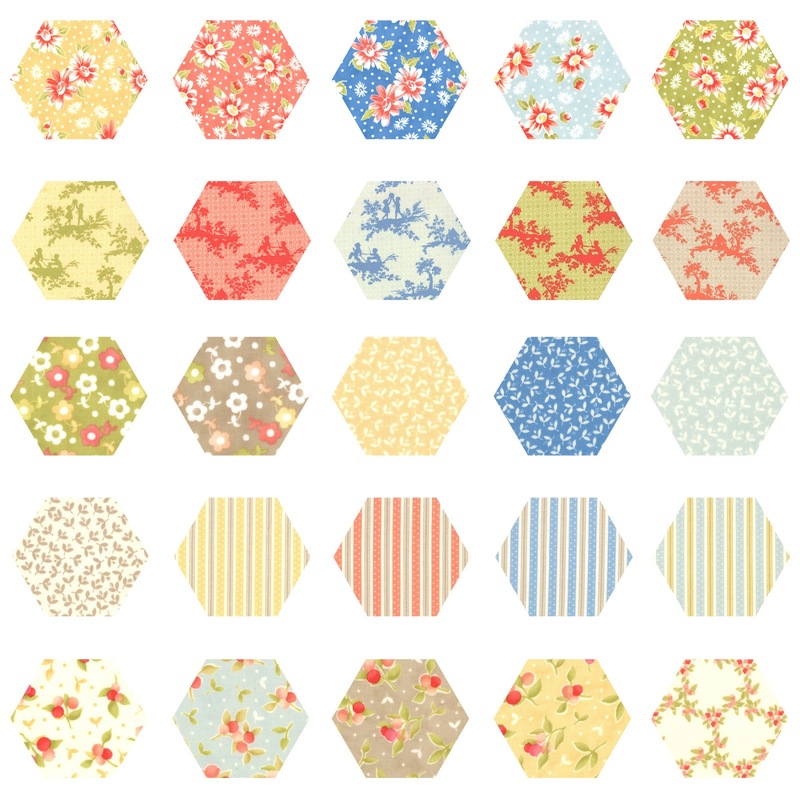 With any purchase of a Hexagon Multi Pack, you'll get a free pack of 100 paper or card hexagons (or 50 of each if you prefer). All my plans for the weekend flew out the window as soon as I picked up my latest custom-made die a few days ago. 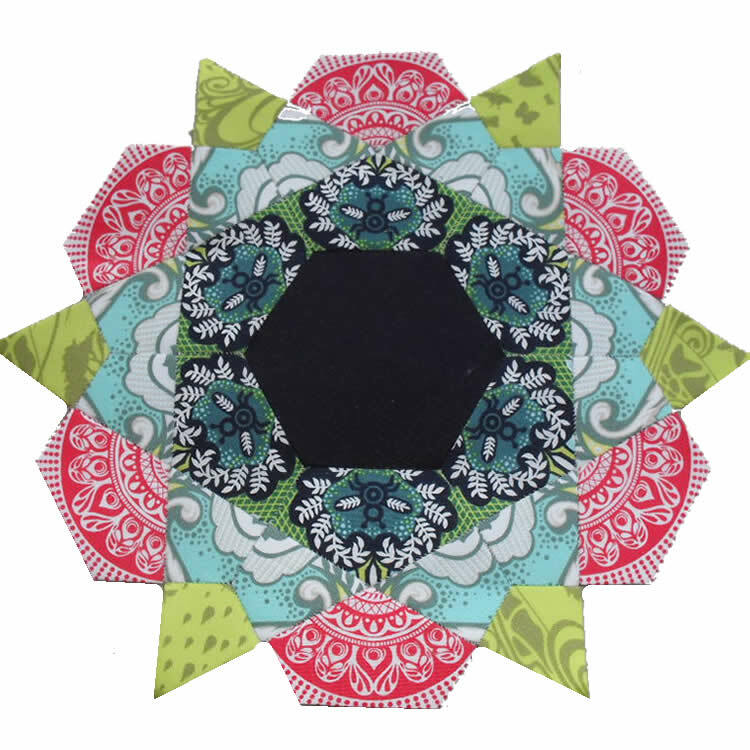 This one will die-cut all the little kites and hats for the Rose Start quilt (my latest hand-piecing obsession). I've just listed the die-cut papers in my store in a mixed pack called the Rose Star Pack. You can choose from paper or card and choose from a pack of 350 pieces (175 kites, 175 hats and 25 hexagons) or 800 pieces (350 kites, 350 hats and 100 hexagons). 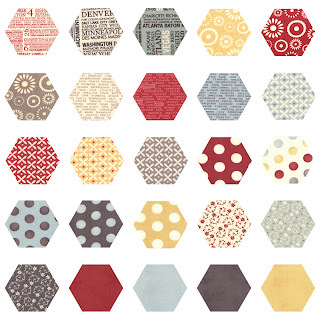 The centre hexagons have 2" sides and the finished blocks are 12" wide by 10" high.The product descriptions will give you more info about measurements and quantities. 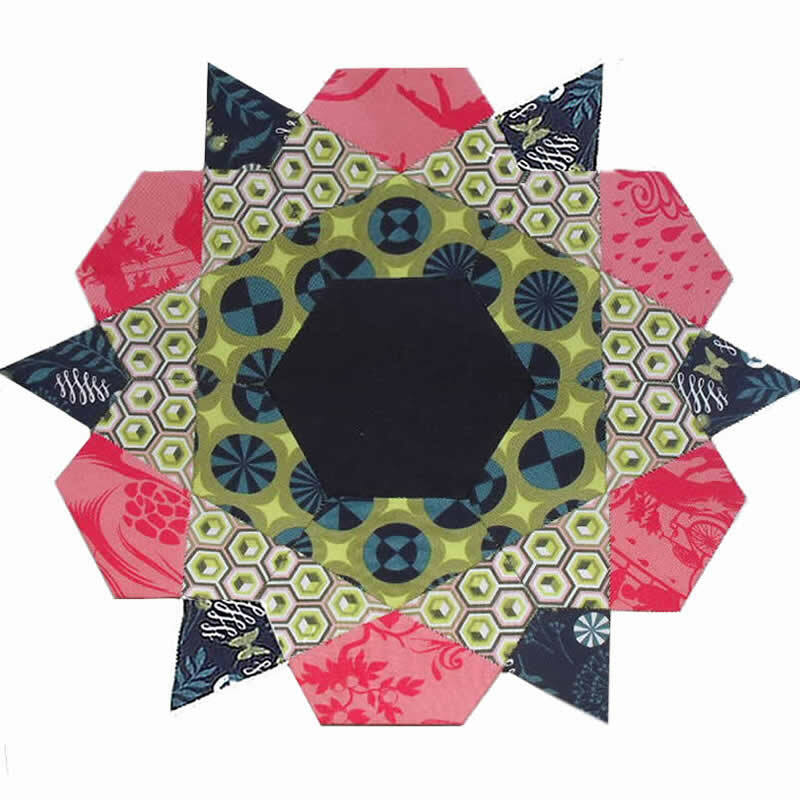 I would love to pre-cut the fabric for you as well but I definitely think fussy-cutting is essential for the Rose Star quilt. 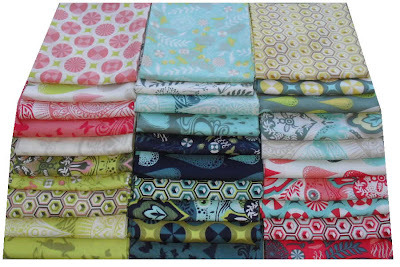 The fabric range I am using for mine is Prince Charming by Tula Pink for Free Spirit.